It’s the fresh ginger and garlic that make these chicken wings so good, and no frying necessary. In a large bowl combine a one inch piece of minced ginger and two garlic cloves along with an 1/8 of a cup each of rice wine vinegar and soy sauce, a tablespoon of vegetable oil, a small splash of sesame oil, a generous tablespoon of chili garlic sauce, a teaspoon of sugar, and some freshly ground black pepper. Salt a 1 ½ pound pack of wings and either cook on a cookie sheet in a 450 oven for 25 minutes, in a cast iron pan over high heat, or on the barbeque. 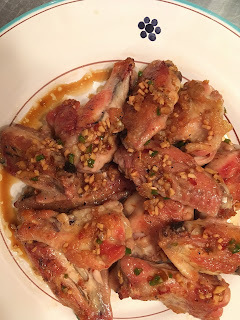 When the wings are crispy and cooked through simply toss with the marinade and serve making sure to include the bits of ginger and garlic from the bottom of the bowl.